THURROCK Harrier athletes have been busy competing in national school competitions. 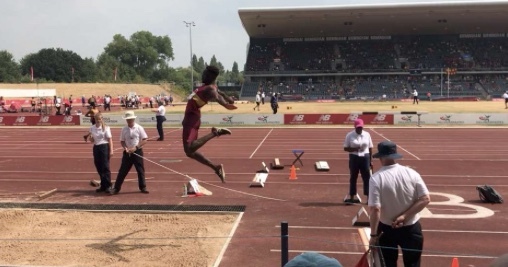 At the English School Track & Field Championship held in Birmingham (13th & 14th July) Theo Adesina (William Edwards), Funminiyi Olajide (William Edwards), & Ruby Bridger (Hathaway Academy) represented Essex. Theo won silver in Long Jump with a personal best of 6.92 in the Inter Boys competition which earned him his 2nd England vest. Funminiyi, in Inter-Girl competition, won Bronze in LJ with 5.81. She also earned her 1st England Vest; Funminiyi and Theo are both heading to Edinburgh on Saturday (21st July) representing England. The English Schools Cup Final held in Gateshead on 7th July also saw Chloe Brand compete with Coopers & Coburn School, not only did she win the 300m with a pb of 46.3 but her year group won.